Cullen Loeffler is unprepared to deep freeze his NFL career, but the venerable Minnesota Vikings long snapper realizes his vocation is as ephemeral as the ice sculptures he helps produce. Life after football accelerated in May when Loeffler, the aspiring entrepreneur, completed minicamp at Winter Park and boarded a plane for his native Texas. Robbie Harrell, freshly graduated from the University of St. Thomas Opus College of Business, was on the flight to Austin — along with a scattered bachelorette party whose musical chairs landed Loeffler and Harrell side-by-side. Harrell did not recognize the guy asking for help with a crossword puzzle. By the time they touched down in the Texas capital, Loeffler and Harrell were budding partners in MNIceSculptures.com, a start-up company with goals to mass-produce decorative carvings for a niche market. The NFL specialist and master’s scholar discovered they were related; Harrell’s maternal grandmother is a Loeffler. The text included a picture of Harrell’s grandmother’s old homestead. It happened to be the bed and breakfast at which Loeffler and his wife Jardin were staying, and had for years. Loeffler, who is eyeing a second career in private equity, staked five figures in Harrell’s company after co-founder, Stu Lombardo, decided to cash out. These are not artists chain-sawing towering ice castles or sculpting exotic animals and superheroes for public display. The star of this operation is the computer numerically controlled (CNC) carver. 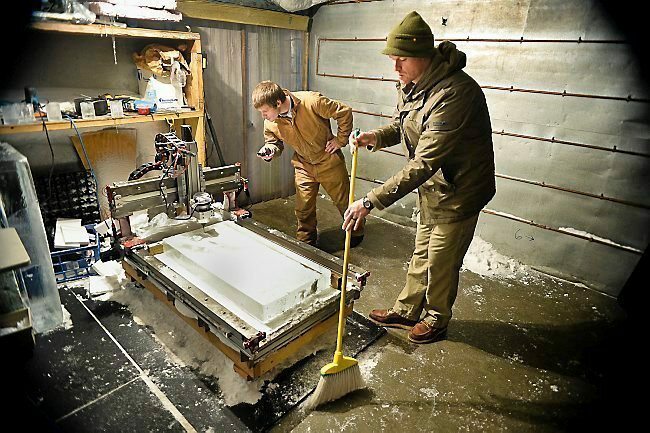 The founders spent $10,000 to customized the machine to pump out three-dimensional corporate emblems, wedding logos, fraternity crests, team insignias and neon signs — anything that can be sculpted from a 40x20x10-inch block of ice. The company website showcases the craftsmanship of ice engineer Mark Lawson and testimonials from Twin Cities customers. Typical sculptures range in price from $125 to $350, with ice bars going for $1,000. The ski boat went for $15,000. Their home base is a non-descript warehouse tucked into an industrial stretch of Shakopee. The company buys ice and leases production space from Sculpture Ice. It rents a freezer at the Baker Center in downtown Minneapolis for distribution. Inside the warehouse feels like a meat locker, but it’s a precise cold. To prevent ice from chipping, cracking or enduring other forms of “thermal shock,” slabs are maintained at 26 to 28 degrees. Blocks are nurtured before they are carved. Filtered water is pumped over layers to prevent air pockets from spoiling the frozen canvas. The company has room to store 110 blocks, which are stacked in a cramped freezer. After a Vikings practice in mid-December, Loeffler visited the warehouse to check in with his partners and review upcoming projects, including a life-sized ski boat planned for the Minneapolis Boat Show. A long season was about to get longer for Loeffler three days later in Miami. He bounced a late fourth-quarter snap to punter Jeff Locke, resulting in a block and game-winning safety for the Dolphins in Miami. But on this night, Loeffler is all business, locking down a block as Lawson punches a series of commands into a computer, unleashing the carver for a series of repetitive, ear-piercing maneuvers. Software converts J-peg images into a program that allows Lawson to calibrate the width and depth a particular image requires and crank out a sculpture in about 20 minutes. Loeffler grabs a broom to sweep away snow flying in every direction as a cursive Minnesota Vikings’ “M” takes shape in the ice. “So many people say, ‘Well, that’s an interesting business to be a part of,’ but I don’t think they recognize how neat ice sculptures are until they really learn about them,” he said. Harrell said handcrafting hobbyists dominate the market, but there are few commercial businesses that produce sculptures for centerpieces, buffet tables or outdoor winter parties on an industrial scale. The gold standard is a Canadian company with multiple engineers and CNC machines that make about 40,000 products a year. Harrell declined to reveal sales figures but said the company hopes to gross $60,000 by mid-2015. “Hopefully, one day we’ll see these things pumped out on conveyor belts and boxed up for shipment around the United States,” he said. Loeffler has pitched in with deliveries, but his role beyond investment is helping craft a long-term strategy and marketing. His affable personality and 11 years in Minnesota help with the company’s profile. “This has played a huge role in accelerating our company,” Harrell said. “The respect I have received from (Loeffler) and other players has been outstanding. Professional athletes routinely are hit up by their entourages for time and financial commitments to this venture or that can’t-miss opportunity. And the landscape is littered with failed restaurants, bankrupt sneaker companies and foreclosed real estate developments that highlight the risk of blind ambition. Loeffler, a 34-year-old unrestricted free agent who played out his most recent $3.4 million contract, was asked why he bought into MNIceSculptures after such a random connection.